Marketers in every industry and at companies of all sizes of all shapes and sizes know they should be doing research before acting. Whether it’s getting a better understanding of top terms and phrases to use in messaging or getting a view into your target audience, research is a powerful tool to make our jobs easier while producing better results. But research, I believe, has a bit of a PR problem. Unfortunately, research is still seen as a complicated, prickly subject that belongs in the hands of a few chosen people at agencies or internal departments that include the words “quantitative” or “insights” in their titles. We’ve been taught that to do research right, it takes a lot of time and money. It takes focus groups and surveys and weeks to analyze the results. By that time, your messaging may have shifted, and your campaign might already be wrapping up. But the good news is that things are different today. 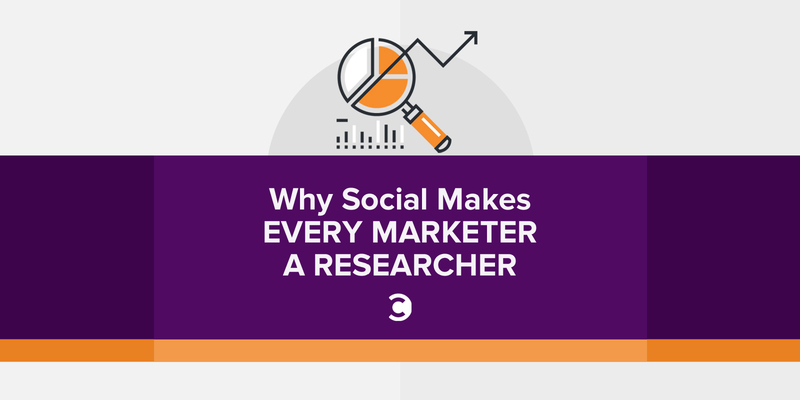 With all the data marketers have available today, there’s no reason that every marketer out there can’t be a researcher in their own role. The specific data I’m talking about is social media data, and it’s changing the game for researchers everywhere. Social media data—the daily patterns of postings and users from Facebook, Twitter, Instagram, Tumblr, LinkedIn, and beyond—can give marketers of all sizes a view of what’s important to their audience. I should know: I run the Research team for Spredfast, the leading enterprise-level social media company. The charter for my team is to analyze the billions of pieces of social content we have flowing through our systems every day to find patterns in how consumers and brands meet on social channels. We search for findings, patterns, and trends that can help make the industry, our partners, our customers, and ourselves smarter. 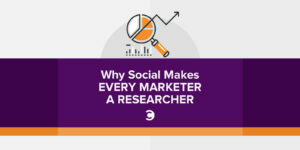 So why do I think social data changes the game for research? Here are three reasons. In the past, marketing research has been the practice in creating new data points, data that hasn’t existed before. Conducting a focus group—bringing in people to answer questions about a marketing message or product—is a perfect example of data creation. Researchers ask questions and get answers, resulting in data. But with social data, there’s a good chance any question you’re asking has already been answered. Social data gives you a constant stream of content—what’s been shared, what’s been talked about, and the who and where behind the conversation—going back months, even years. Want to know what people think about your product? There’s a good chance they’re already telling you. And because social data gives you access to the entire conversation, you can get the same information about your competition or other brands you’re interested in. Besides, while focus groups are great for detailed research, attitudes change over weeks and months. The way that potential consumers feel about a product isn’t the same in the summer as it is at the holidays. And who’s to say that the twenty people that answered your focus group invitation are representative of who you’re selling to? With social, it’s not uncommon to get millions of data points every week. It’s a key data source for any modern marketer. Not only does social bring a ton of data for marketers, but it also bring deep data—dimensions that most sources could only dream of. The most common way of thinking about social data is to search what people are talking about. And that’s great—there’s a lot of value there for most marketers. But it’s the other types of data in social that can give you a real edge. Let me give you an example. Recently, we released a report on personality profiles in social media. We were interested in applying Myers-Briggs personality labels (labels that identify “introvert,” “extrovert,” and other descriptors, resulting in four-letter designations like INTJ, ESTP, etc.) to social media users. We thought it would be interesting to understand how introverts interact with content versus extroverts—how “sensing” personality types (people that see things more literally) post versus “intuitives” (people that tend to read between the lines for hidden meaning.) The big question was this: How do we identify someone’s personality type on Instagram? As it turns out, tens of thousands of people just tell you. We searched Instagram bios and found a huge number of people describing themselves with their Myers Briggs four-letter codes, and then parsed through over one-hundred thousand posts to find patterns. Turns out, extroverts get more comments on their posts, and introverts get more likes. Introverts love art and anime, extroverts love posting selfies. 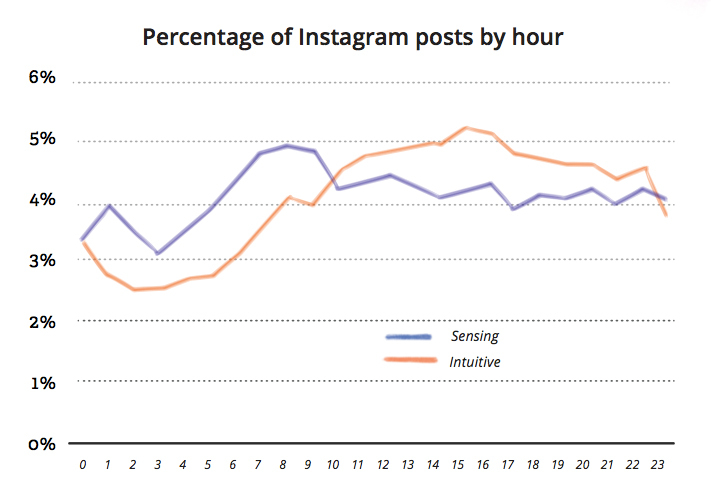 Sensing types post early in the day, but intuitive types wait until after lunch to post once they’ve had a chance to absorb the world around them. The point here is that people will tell you almost anything on social media—you just have to know where to look. Tools like Spredfast’s Intelligence can search Twitter and Instagram bio terms and return thousands of results in seconds—terms where people are identifying themselves as people you’re interested in, or that love your competition. But profile searches are just the beginning: Social data allows you to search by gender, age, followers of certain accounts, location, influence, sentiment, and combinations of all of the above. Interested in men, aged 18 to 24, that live in New York, like skiing, and follow the Green Bay Packers on Twitter? You can do that. The third great thing that social brings to the research world is new data, every year. With emerging platforms and new functionality, new data becomes available to marketers. One example of this is Facebook’s release of reactions—the laughing, love, angry, wow, and sad expressions that have been live for about a year. Not only do these reactions allow users to express more than simple positive emotions towards messages, but they allow marketers to track emotional response in ways we’ve never been able to do before on social. 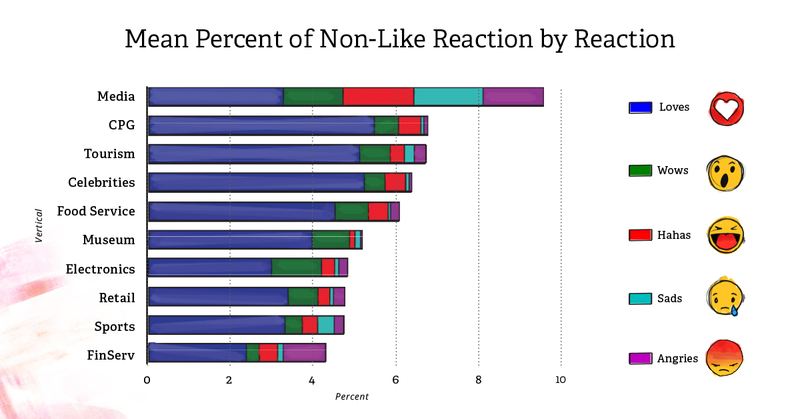 In our latest report on Facebook reactions, we found that not only is reaction usage increasing each month, but that the usage is driving a more complex understanding of success for social media content creators. Want to get a “wow” reaction from the crowd? Make sure you’re crafting content that earns that response, and then measure the results accordingly. Want to know how the competition is keeping their audience entertained and laughing? Mine their social data to understand which videos are getting the highest laugh/reaction ratio in their content portfolio. Analyzing social data—with its real-time availability, huge scale, and deep variety available to mine—can be as simple as a text search, or as powerful as targeting on specific user attributes. Either way, it’s a key way for modern marketers to build an advantage and to gain new levels of understanding about their content, targeting, and creative. So, if you want to join me in pulling the term “research” back from the chosen few and giving it back to the masses, social data is here to help. Editor’s Note: This post is part of a paid collaboration between Convince & Convert and Spredfast. Chris Kerns is the VP of Research & Insights at Spredfast, a social software platform that connects enterprise organizations with the people they care about the most. His research has appeared in The New York Times, Forbes, USA Today and The Wall Street Journal, among other publications. He is also the author of Trendology, the first book to dive into the advantage brands can build using a data-driven approach to real-time marketing.